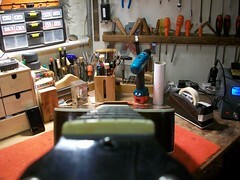 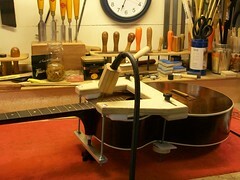 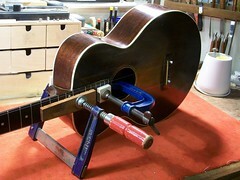 Here’s a very old guitar on the workbench. 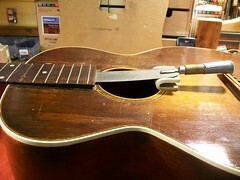 It’s a Gibson L1 made in 1926. 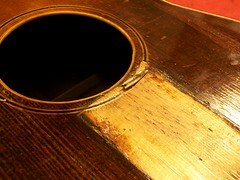 This was the year that Gibson reintroduced the L1 as a flat-top, previously it had been a carved arch-top instrument. 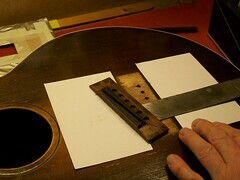 More early Gibson L1 info Here…. 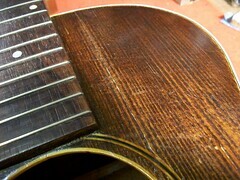 This old darling has had a bit of a hard life. 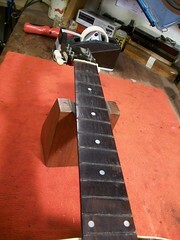 It’s seen a few changes to its bridge and finish and needs a lot of work to bring it back to optimum playability. 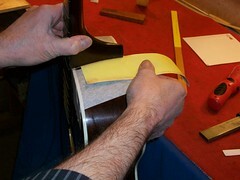 Repairing the split in the bridge can only be carried out with it removed from the soundboard. 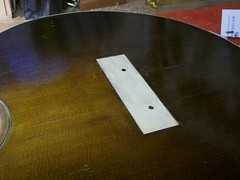 The finish is scribed around the edges of the bridge and the soundboard protected. 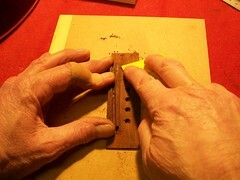 A block is heated and rested on the bridge, the heat transference is enough to soften the glue holding the bridge. 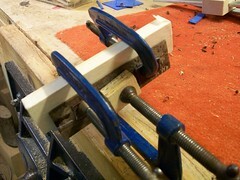 The bridge is held in a purpose made jig and a channel routed into the underneath. 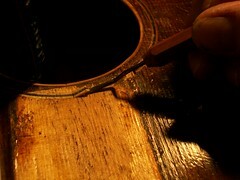 A Rosewood piece is inlayed into the channel and smoothed down. 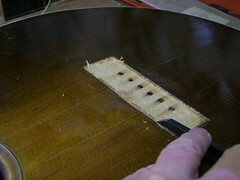 The bridge-pin holes are re-drilled and the surface sanded. 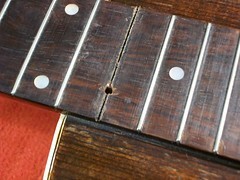 The repair to the bridge is now complete. 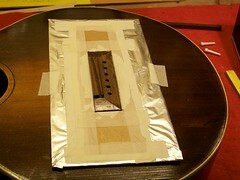 The bridge is then glued into place. 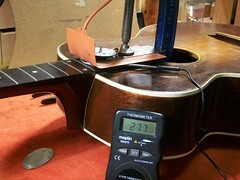 The playing action on this old L1 can only be restore with a neck reset. 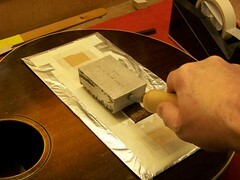 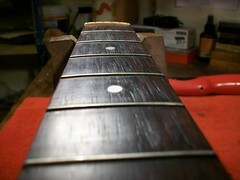 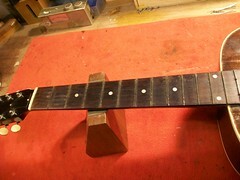 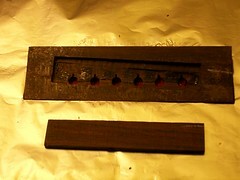 The 15th fret is heated and removed. 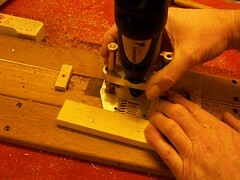 A 3mm hole is drilled through into the dovetail cavity, the finish is scribed around the heel. 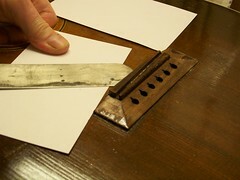 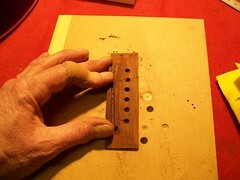 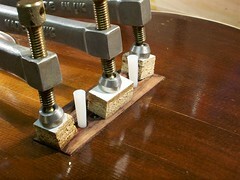 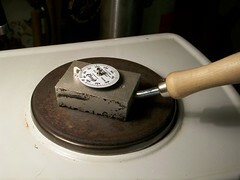 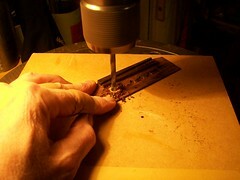 The fingerboard extension is heated to soften the glue. 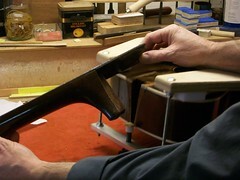 Steam is then pumped into the dovetail cavity and the neck removed. 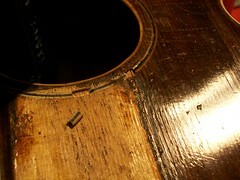 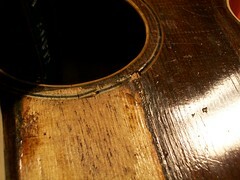 With the neck removed the Rosette can be repaired. 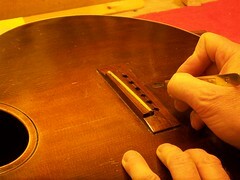 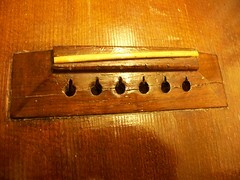 A section of the rosette that is hidden under the fingerboard can be used to repair the visible break. 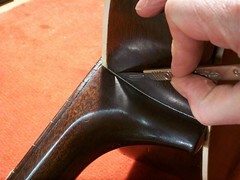 The neck angle is adjusted at the heel and the neck reset. 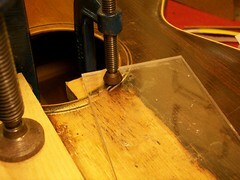 All splits and cracks can be easily sealed and cleated. 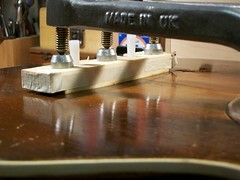 After the neck reset the fingerboard has taken on a slight hump at the neck-body join, this is quite common after a neck reset. 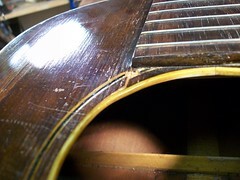 To solve this it is necessary to remove all frets and re-shoot the fingerboard thus ensuring that there will be no string choking around the upper area of the fingerboard.